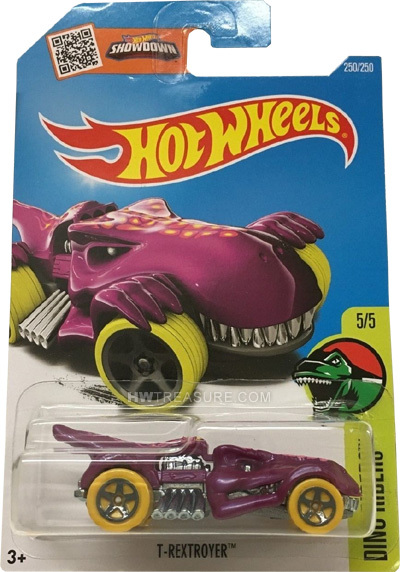 250/250 is a 2016 Treasure Hunt and 5/5 in the Dino Riders series. The top of the magenta vehicle has the low production symbol surrounded by purple and yellow fiery scales. 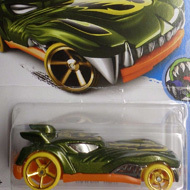 The car has a chrome interior, yellow 5-spoke wheels with gray rims, and an unpainted metal Malaysia base. 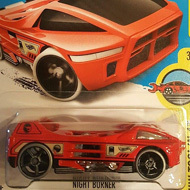 This vehicle can be found in mix “M” of 2016 Hot Wheels mainline cases. The T-Rextroyer made its debut in the 2010 Color Shifters Creatures series. It is a unique design based upon the Tyrannosaurus rex and features a toothy grille, clawed fenders, and a tail.